This morning Congressman Kevin McCarthy hosted United States Agriculture Secretary Sonny Perdue in Bakersfield with three dozen of our community’s growers and dairies. Congressman Kevin McCarthy and Congressman Paul Cook were pleased to secure a provision in the Conference Report for the Fiscal Year 2019 National Defense Authorization Act that would create a funding stream for Naval Air Weapons Station China Lake to address water and energy infrastructure priorities. Today, Congressman Kevin McCarthy, Co-Chairman of the Congressional Valley Fever Task Force, introduced H.R. 6562, the bipartisan FORWARD Act with fellow Co-Chairman Congressman David Schweikert (AZ-6) and Task Force Members Congresswoman Martha McSally (AZ-2), Congresswoman Karen Bass (CA-37), and Congresswoman Kyrsten Sinema (AZ-9). 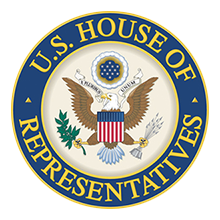 Today, Congressman Kevin McCarthy, Congressman Paul Cook, and House Natural Resources Committee Federal Lands Subcommittee Chairman Tom McClintock authored and signed onto a letter to the U.S.
House Majority Leader Kevin McCarthy (CA-23) spoke on the House floor today to express support for U.S. Immigration and Customs Enforcement (ICE) officers and personnel and denounce calls for ICE's abolishment. Congressman Kevin McCarthy is pleased to announce that the Kern County Department of Airports will receive $500,000 in Small Community Air Service Development Program (SCASDP) grant funding from the U.S. Department of Transportation (DOT) to expand travel service at Bakersfield’s Meadows Field Airport with new non-stop flights to Dallas Fort Worth, Texas. "President Trump has chosen another highly qualified judge with a proven record of applying the law based on the text and original understanding of the Constitution. Congressman Kevin McCarthy sat down in-studio with KERO-TV Bakersfield to discuss the latest developments in the Presidential race and high-speed rail. Federal spending on California's proposed high-speed rail system should be halted until September while a government report is prepared on the $99-billion-plus system's viability, an Antelope Valley congressman told a congressional panel Thursday. Bakersfield's athletes just keep making news. Not only did our own Colby Lewis pitch in the World Series game Thursday, Jake Varner won gold in free style wrestling at the Pan American Games. Some local veterans swear they wouldn't be alive today if it weren't for the health care they receive from the U.S. Department of Veterans Affairs. Others say dealing with the VA is like walking through molasses. You may someday reach your destination -- if you live that long.